there. Please review the Test Requirements section for details. Here is the list of transaction tables. 1. Any table having a column name Processed. 2. Table name like %Log. 3. Table name like %Run. 4. Table name like %MA. 5. Table name like %SLA_Measure. 6. Table name like Fact%. 7. Table name like M_Transaction%. 8. Table name like C_Allocation%. 9. Table name like M_StorageDe%. 10. Table name like R_Request%. 11. Table name like AD_WF_Process%. 12. Table name like AD_WF_EventAudit%. 13. Table name like AD_WF_Activity%. 14. Table name like M_TaskList%. 15. Table name like %PInstance%. 只有定义了主键的表，才可以有： 1. 附件 2. 聊天 3. 审计 4. 请求等等 参考：https://idempiere.atlassian.net/browse/IDEMPIERE-2811 ==关于大小写== The id columns should end in uppercase _ID ==允许变更日志== 表示在字段级，该列的数据变化将被记录。 ==主键列== 简单表，最好设置一个key，只用于CRUD，报表，modle都可以不需要。 多键表，不需要设置任何column为isKey，这种表将无法使用附件、聊天、审计、请求等等。比如ad_process_access这种表，又有ad_process_id，又有ad_role_id，他只是一种关系记录表。 所有多键表：285个 SELECT name from ad_table where ad_table_id not in (SELECT ad_table_id FROM AD_COLUMN WHERE ISKEY ='Y'); 所有单键表：736个 SELECT ad_table_id,name FROM AD_COLUMN WHERE ISKEY ='Y' （737个） SELECT distinct ad_table_id FROM AD_COLUMN WHERE ISKEY ='Y'（736个） 查询多个主键的表（肯定有问题） SELECT ad_table_id, name from ad_table where ad_table_id in (SELECT ad_table_id FROM AD_COLUMN WHERE ISKEY ='Y' group by ad_table_id having count(ad_table_id)>1) ; 竟然是AD_SessionInfo_v，去看看。 关于多列主键（复合主键）在id中已经废弃了，用户可以做一个多键索引做主键，参考： https://groups.google.com/d/msg/idempiere/bCJn_aLQIZ0/NydSgBM1BgAJ ==Callout== Callout Code allow for the execution of code when the user tabs off of the field. This is a data entry consequence and should not be used for validation (which should occur before a user leaves the field). An example of a callout is in the Sales Order window. When the user enters a Business Partner, the callout that is executed updates other fields in the window such as Price List, Delivery Rule and Partner Addess. ==Identifier标识符列== Identifier indicates what displays in the field or drop down list when a user selects it. For example, when the user selects a Partner Group, the Partner Group Name not the Partner Group ID displays. It is possible to have multiple Identifiers defined and the fields will display separated by an '_'. 外键ID链接到主表时，可以按照列标识符来显示。比如： 订单表：主键c_order_id，外键ad_org_id 组织表：主键ad_org_id，其他列，比如value，name 当订单表链接组织表时，订单窗口默认显示ad_org_id。 如果你想显示name，组织表的name列设置为isIdentifier=Y， 组织表的其他列同理，多个列标识符用”_“连接。且使用标识符顺序号定义。 ==Synchronize Column列同步== 'Synchronize Column' button should be selected if you are creating the columns in the database or if you have changed part of the table definition (e.g. the Constraint Name or increased the Field Length). 将AD对象的Table定义同步到数据库，或者同步数据库的列变动到AD对象的Table。 ==Selection Column搜索选择列== Selection Column indicates what fields display in the initial search window if Search is selected. All fields on a table are available in the Advanced Search tab. 每个页签都有高级搜索框，设置该列为搜索列显示。相关”选择顺序“可以设置字段的顺序。 ==Reference引用== 参考：列的显示控件类型。 ReferenceElementHandler.java ReferenceListElementHandler.java ReferenceTableElementHandler.java http://wiki.adempiere.net/Entering_Data_-_Fields_and_Buttons 列的数据引用有3种类型：数据类型、列表、表。分别对应上面3个handler。 数据类型D：用于reference本身，定义控件列的类型，比如按钮、日期等。通常不用维护，除非新增控件。 列表L：比如”月份“这种静态列表。 表T：比如任何一个表。 各种引用的数量 SELECT ValidationType, count(ValidationType) from AD_Reference group by ValidationType L,328 T,232 D,38 各种数据类型（控件）的使用情况 SELECT AD_Reference.name, count(AD_Reference.name) FROM ad_column ,AD_Reference where AD_Reference.ad_reference_id=ad_column.ad_reference_id group by AD_Reference.name order by 2 Payment,2 Color,2 FilePath,2 FileName,3 Time,4 Chart,4 Assignment,10 Binary,11 Memo,17 Text Long,18 URL,36 Image,41 Location (Address),47 Locator (WH),52 Product Attribute,97 Costs+Prices,150 Account,280 Button,333 Date,503 Quantity,522 Number,598 Text,750 List,758 Amount,792 ID,855 Integer,886 Search,922 Date+Time,2504 Yes-No,3479 Table,3838 String,4494 Table Direct,4626 ==TableDirect引用== 这个文章很符合coder的胃口，结尾的结论精彩极了 http://blog.51cto.com/newmoon/988142 ==Reference key引用关键字== 如果引用是”列表“或”表“，则需要指定引用ID（引用关键字）。 ==Dynamic Validation动态验证== 参考：表AD_Val_Rule 动态验证可以根据上下文来对引用的数据进行校验过滤。比如： 订单的仓库字段，加上动态验证后( M_Warehouse.AD_Org_ID=@AD_Org_ID@ )，只显示本组织的仓库记录。 除了可以使用sql验证，还可以使用java，java脚本（JSR223）。 SELECT type, count(type) from ad_val_rule group by type ==虚拟列== I did some reverse engineering and find out that you can use virtual columns in report parameters, but you have to do some setup in application dictionary 1. Open table AD_Process_Para and change size of column ColumnName to some bigger value (current size is 60, virtual columns in tables can have max 2000 chars so you can change it to 2000 or some number which will be enught for your selects used in virtual columns) 2. Open table AD_PInstance_Para and change size of this column too (same reason as previous step) Don't forget to synchronise columns ! 3. Setup virtual column in your Report table as you need (e.g. '(SELECT C_Country_ID FROM C_Location WHERE C_Location_ID=AD_User.C_Location_ID)') 4. Now, when you are adding Report Paramter, fill ColumnName with same SQL as it is used in your virtual column - do not fill column name as usual! Because in condition has to be compared SQL with value. 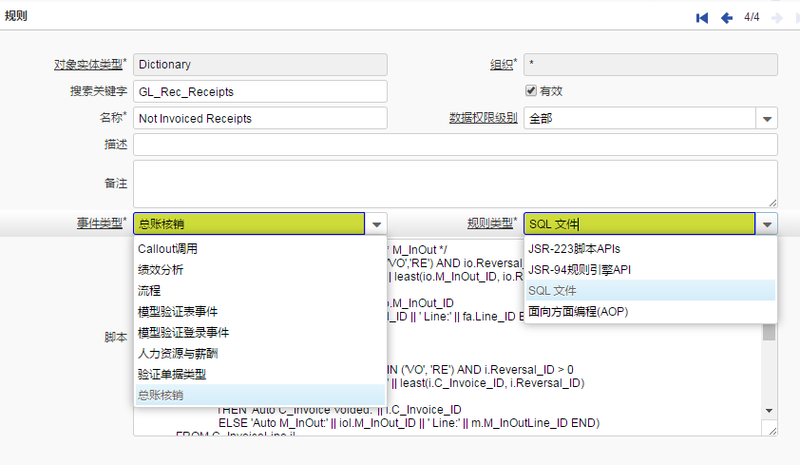 Run Cache Reset only just to be sure and enjoy your virtual column in report parameter :) ==default value 默认值依次取值顺序：常量、变量、SQL语句。 按理列默认值与数据库的默认值是一致，二者可以同步。当列被字段使用在窗口后，默认值无需用户填写，自动产生，后续你可以修改该字段的值。当然如果列是主键、父键、实体或者按钮，默认值是无效的。 字段不能使用缺省值来互相更新，只能用callout来进行（207-4-28）。 The default is only evaluated, if no user preference is defined. Default definitions are ignored for record columns as Key, Parent, Client as well as Buttons. 关于列默认值和字段默认值的关系，使用下列查询 select c.name, a.name, a.defaultvalue , b.defaultvalue from ad_field a inner join ad_tab c on a.ad_tab_id=c.ad_tab_id inner join ad_column b on a.ad_column_id=b.ad_column_id where a.defaultvalue is not null; 从“制造工艺路线”可以看出字段默认值可以比列默认值更符合页签场景。 ####AD_Client 和AD_Org的列验证规则 select b.name,a.name,r.name,v.name ,a.DefaultValue,b.AccessLevel,l.name from ad_column a inner join ad_reference r on a.ad_reference_id=r.ad_reference_id inner join AD_Val_Rule v on a.AD_Val_Rule_ID=v.AD_Val_Rule_ID inner join ad_table b on a.ad_table_id=b.ad_table_id inner join (select l.name,l.value from ad_ref_list l where l.AD_Reference_ID=5) l on b.AccessLevel=l.value where a.name='Client' order by 4 当应用到很多org字段时候，可以参考如下引用方法: https://groups.google.com/forum/#!topic/idempiere/sQkYhD0l4Iw ==可更新/总是可更新 https://idempiere.atlassian.net/browse/IDEMPIERE-163 AD_Column table has some elements that are relevant for UI, so those must be allowed to be defined on field (defaulting to column if they are empty).